When you want to have a cleaner home, there are ways to sanitize it faster, easier and more naturally. While you have learned an assortment of house cleaning tips from your parents, there is always something new to learn so that your home smells and looks fresher. Here are nine smarter ways to clean your home on a daily or weekly basis. Getting rid of the clutter in your home is one of the best house cleaning tips. You might spend several hours a week removing the canisters and small appliances from your kitchen countertops. In addition to needing to remove the clutter from surfaces to wash or dust the items, the small appliances, cookie jars, and other items can become grimy from flying grease or food particles. You should also get rid of the excess clutter throughout your home to allow for faster cleaning. If you are worried about the toxins in store-bought products, you can make your own cleansers with items you can buy in the supermarket. You can buy spray bottles to make your own window cleaner. Just fill them with white vinegar mixed with water. Rather than wasting paper towels, you can use soft cloths that are easy to wash and dry. If you need to remove stains from your kitchen countertops, then sprinkle them with baking soda before spraying the area with white vinegar. Stop wasting time walking from one side of the room to the other while cleaning. Begin cleaning at the top of the room, and also, work your way from right to left. With this method, dust filters down from the upper walls to the floor so that you will only need to vacuum the carpet once. Carry a garbage bag with you as you are cleaning so that you can throw away any items right away. A professional home cleaning service provides totes for the cleaners so that they have the items required for sanitizing a surface handy. Keep your homemade cleaners, cleaning cloths and other items in a plastic tote so that it is easier for you to clean a sticky tabletop or a dirty switch plate. Before storing your cleaning tote in a cabinet a child can’t access, make sure to mix new homemade cleansers so that it is faster to clean surfaces at any time during the rest of the week. If you want to have a home that smells fresh, add a few drops of essential oils to your homemade cleaners. You can find essential oils at hobby stores and fabric shops. There are numerous scents to choose from, including citrus orange for the kitchen or lavender for the bedroom. You can also select essential oils known for eliminating bacteria, including peppermint or cinnamon. It is also possible to add essential oils to the water that you use for mopping the floors so that your entire home smells wonderful. After eliminating the clutter in the bathroom, it is easier to keep it clean. Begin at the top of the bathroom by cleaning any mould or soap scum from the bathtub walls. Next, clean the countertop, faucet and sink with your homemade cleanser. Spray your homemade vinegar mixture onto the toilet seat and tank before wiping it clean with a cloth. You can pour baking soda or vinegar directly into the toilet bowl before scrubbing it with a special brush. If you want to vacuum a room quickly, you should have a great vacuum cleaner that has a high-efficiency particulate air filter. Unless your home receives a lot of foot traffic, you don’t need to move all of the furniture each week when you vacuum. Concentrate on vacuuming the areas near the doorways and the centre of the room where people walk. If you are vacuuming the dining room, then you will want to focus on the area underneath the table and chairs. A few times a year, you should move the furniture to vacuum the debris that collects under the couches or beds. 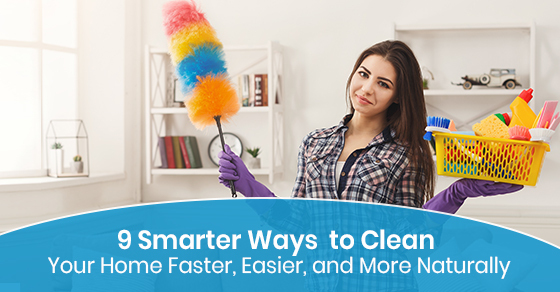 You don’t need to spend several hours mopping the floors in your home. First, get a bucket that you can fill with sudsy water so that you can use a sponge mop for scrubbing the floors that don’t have carpets. Remove the rugs and take them outside for shaking, and mop the floors quickly in both directions to remove dirt. If the floor is extremely dirty, then you should rinse it with clean water to avoid streaks. Keep the room ventilated so the floors will dry as fast as possible. If you don’t have time to clean your home due to a busy schedule, then call a professional home cleaning service. Today, cleaning companies can use natural cleansers without toxins that create a chemical odour or that leave dangerous residue on surfaces. You also don’t need to remain at home while it is being cleaned because cleaning companies usually perform background checks on their employees. For more information about how to keep your home in pristine condition, please call Sunrise-cleaning at 289-814-1824 or contact us here.